The "express" does not refer to speed, rather to the fact you have the same seat for a fairly long trip through the Alps, traversing them north to south or south to north from Switzerland to Italy. Two lines on this Bernina express route are a designated World Heritage Site. 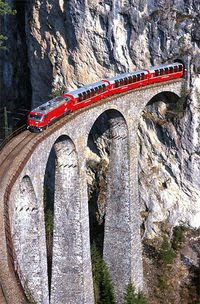 Can purchase tickets and reservations for Bernina Express and Bus at http://www.rhb.ch/reservation . You will be given a "dossier number". With the dossier number you can pick up the travel documents at any train station in Switzerland. Note: If you do not pick up the tickets/ reservations your total fee will be charged. The Bus from Tirano to Lugano is included in the Eurail pass but you must make a reservation in advance. You can make reservation for Bus and train in advance without holding the Eurail pass. One can change the reservation dates (not clear if there is a fee for this or not). Rhätische Bahn said the most important thing is always to inform them of the travel plans and changes to avoid problems. Please note: Eurail Pass is a sponsor of our great European Train Adventure. I would love to read the compare and contrast essay devoted to Switzerland and Austria, these two incredibly beautiful countries. I wonder why there are so few media posts devoted to them. The view itself is breathtaking, very phenomenon and at the same time quite scary. You have shared an incredible post, the view gives me a very nice view about what Switzerland have to offer. I love what I see. There are many chapters of research project, which one can only effectvkey write with the help of professionals. This is why we are here, to deliver only the best. We never dissapoint. Really great, I always look forward to a Swiss Bernina Express trip!